Happy Cyber Monday! Don't forget to check out the sales and deals this Cyber Monday has to offer. There are quite a few awesome deals (we are taking advantage of Yesstyle's and Memebox's deals to pick up a few goodies for ourselves)! Anyways, you might have noticed that for the past couple of weeks our Mask Mondays has been taken over by lip mask reviews completely (except for Halloween, but that was so worth the share). It's a little challenge I made myself and so far I'm still on schedule (kind of proud of myself ^^). 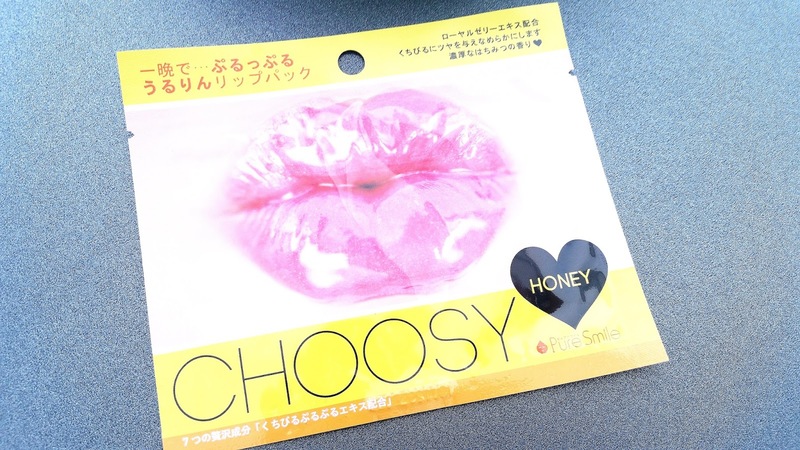 Today's lip mask review is, of course, these Choosy Lip Pack in Honey. Someone asked the other day if I use any lip masks aside from Choosy and the answer is yes but not at the moment. It's just the challenge I made myself was to use and review all the Choosy lip masks I have before the end of the year, so yeah. Aside from Honey, there are just 3 more types of Choosy lip masks in my stash that I still have to try and review. So if you are tired of Choosy Lip Pack reviews, don't worry, it's almost over. 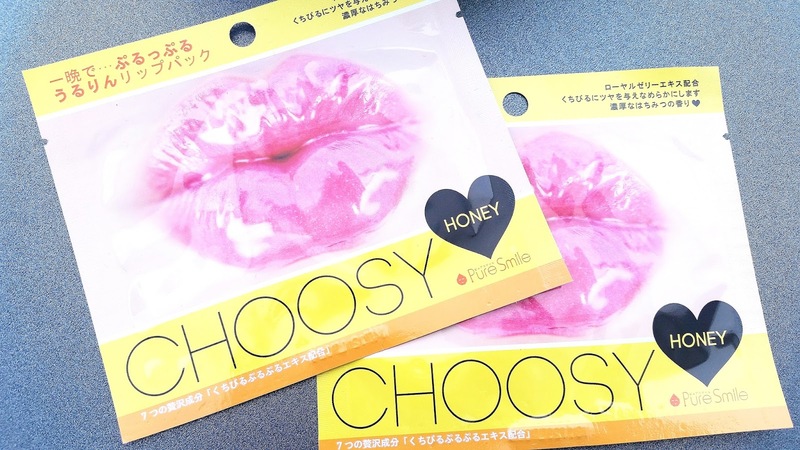 Product Description: Pure Smile Choosy Lip Packs in Honey are moisturizing and softening lip masks. These hydro gel lip masks are formulated with nourishing ingredients like royal jelly, honey extract, ceramide, collagen and more. The lip masks are easy to use as well. To Use: Cleanse your lips and hands first. If needed use a lip scrub ahead of time to remove any dead skin. Remove the lip mask from its package and apply it onto the lips. Leave it on for 5 to 30 minutes (can be left on longer). Remove the lip mask and apply lip balm. Tip: it's more effective to use this lip mask after a shower or bath. Ingredients: Water, glycerin, butylene glycol, ceratonia siliqua gum, xanthan gum, royal jelly extract. milk protein extract, bee venom, honey extract, niacinamide, calcium pantothenate, sodium ascorbyl phosphate, tocopheryl acetate, pyidoxine HCI, maltodextrin, silica, sodium starch octenylsuccinate, simmondsia chinensis (jojoba) seed oil, hydrolyzed collagen, beta-glucan, sodium hyaluronate, chondrus crispus (carrageenan), piper methysticum leaf/root/stem extract, cetyl ethylhexanoate, allantoin, ceramide 3, calcium lactate, polyglutamic acid, aloe barbadensis leaf juice, PEG-60 hydrgenated castor oil, fragrance, methylparaben, phenoxyethanol, disodium EDTA, iron oxide (Cl 77492). As with every Pure Smile Choosy Lip Pack review, I've highlighted the ingredients unique to this lip mask above. All Choosy Lip masks have generally the same basic ingredients and usually the only differences are the highlighted ingredients. This gives you a general idea of what's different between each mask. Some lip masks have certain similar ingredients as well. I know I didn't highlight the Honey Extract and that's because although this is the honey mask, honey extract is actually an ingredient in every Choosy lip mask. Packaging: Choosy Lip Mask's signature design is hard to miss because they all have almost the same basic designs. (Pearl and Art lip lines have slightly different designs.) The only difference is their 'flavor' and the color that represents said 'flavor'. 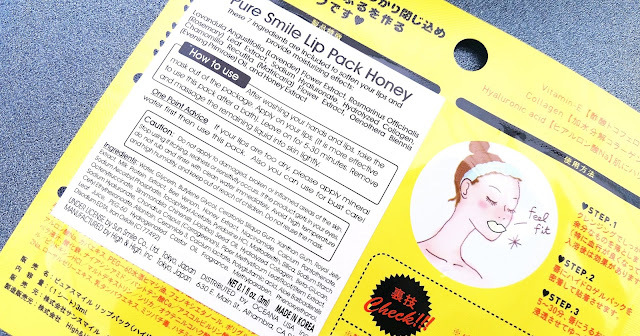 The Honey lip pack came in yellow packaging with the same design as the other original lip packs. Each mask pack includes detailed information regarding the masks. Inside the package, the mask is protected by plastic sheets. Scent: I feel like I'm no longer surprised by the scent of the Choosy lip masks. No matter what or how much/little fragrance they add to their lip masks, the first scent you'll pick up is that base hydro gel lip mask scent. It's not bad but not the best either (I'm kind of just used to it by now). There's a bit of honey scent as well. Color: The lip masks are yellow in color and are opaque as well. Texture: Light and flexible hydro gel texture. It adheres easily and stays nicely. Michelle's Thoughts: For the first time in a long time I patch tested the lip mask serum an hour before I used the mask. I haven't been doing patch tests with my lip masks because they are kind of hard to test. However, after the herb mask incident, I thought I'd do a tiny test just to be safe. This lip mask also contains bee venom, which is an ingredient I haven't tested much, so I wanted to be safe. Anyways, my rather short patch test revealed nothing so I applied the mask on and went about my business. I generally leave lip masks on for an hour (or sometimes longer) as that's when I see the best results. I also use them in conjunction with my lip care routine to get the most benefits out of the products. While this lip mask didn't cause any issues for me, it also didn't offer much in terms of skincare benefits. It did moisturize and soften the lips a bit, but not as much as some of its sister products. I was slightly disappointed when I removed the mask and almost contemplated on using another. The skincare effects this Honey lip mask offered wasn't as long lasting as the others either, which added to the disappointment. I'd rate it as an average lip mask as it did do its job just not well. Final Thoughts: I feel like I've been kind of unlucky with lip masks lately. Hopefully the 3 types I have left will be better than this honey lip mask. 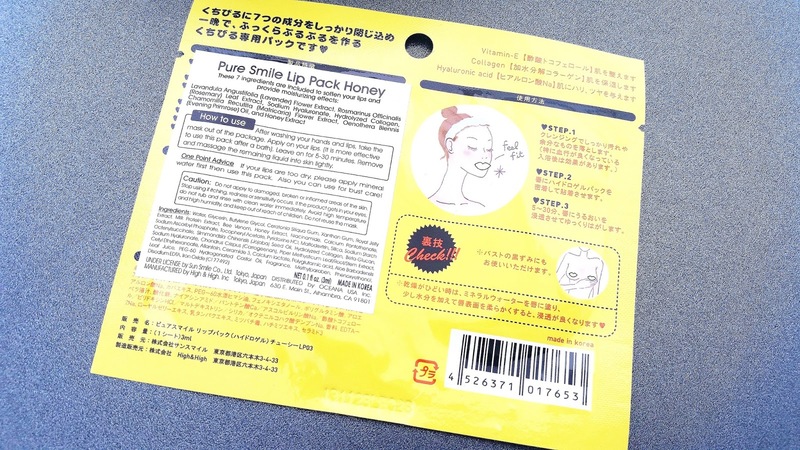 For me, the honey lip mask ended up being a meh/average lip mask. It does offer the benefits it promises but not to their full extends as some of its sister products do. That's what disappointed me. Would I repurchase this lip mask in the future? Probably not. There are a few better choices I'd rather get than this. Do I think this is worth a try? Honestly, no. There are plenty of better Choosy lip masks to choose from, so why get something that's just average? In case you didn't know, Pure Smile Choosy has 3 lines of lip masks, the Original (which includes Peach, Milk, Fruit, Herb, and Honey), the Pearl (which includes Pink, Purple, Black, Gold, and White), and the Art line (which includes lip masks with unique designs.